The city of Liverpool has a reputation as a cultural hub. It has a plethora of quality museums and galleries and there’s always something new and exciting to see. Although our main reason for being in town was visiting was the Double Fantasy exhibition, I soon discovered the Liverpool Tate also had a Roy Liechtenstein display. It seemed the perfect excuse for a full day in the city. Liverpool’s waterfront museum is massive and you could easily spend a full day exploring its many permanent exhibits. We’ve visited in the past, to study the history of the docks, as well as displays on their world-famous music scene. On this occasion, we only had time for Double Fantasy, plus a quick peek at the wonderful ‘Pride Liverpool’ display. 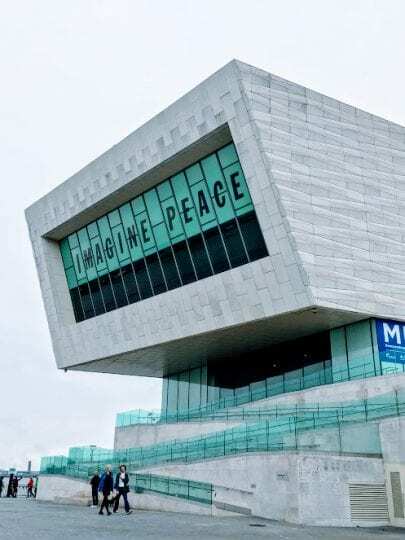 From May 2018 to April 2019, Liverpool Museum has exclusive access to a host of unseen journals and photographs from Yoko Ono’s personal collection. These largely relate to the relationship between Ono and Lennon. This covers their first meeting until his untimely death and its wide-reaching aftermath. The exhibition is set out in different eras of John and Yoko’s relationship. It leads you through their initial meeting, the beginning of their romance, their musical collaborations and the birth of their son, Sean. The final few displays detail the untimely death of the former Beatle and the aftershock that was felt across the world. The entire exhibition is in stark black and white. There’s very little, if any, colour. Massive boards educate you on specific time periods in the lives of John and Yoko and detail both personal and professional achievements. There are several stand out pieces dotted throughout the exhibition. These are: John’s handwritten lyrics to ‘Imagine’ and ‘War is Over’, and his hard-won Green Card. There’s also the heart-breaking transcript of how Ono explained the death of his father to a young Sean Lennon. Despite being filled with messages of peace and hope, the exhibition manages to be quite sombre. It does encourage interactivity and there are some really positive elements. There are memory trees where visitors can write and pin tags, and a memory wall covered in white post it notes with messages of love and support from around globe. This manages to be uplifting and sad in equal measure. The exhibition brings Lennon’s death to the fore and somehow makes it feel very raw even after 38 years. The crowds milling through the gallery are very quiet and thoughtful as they make their way round. The silence was out of respect for the messages being delivered by the exhibition. It was quite sobering to realise Lennon’s empathy towards others wasn’t always appreciated during his own lifetime. Overall, it’s a beautiful tribute to Lennon. However, it also reveals a side of Ono that’s often entirely overshadowed by the legendary status of Lennon. Admission to the Double Fantasy exhibition is free of charge. Further details can be found on the visit the Museum of Liverpool website.